The best movie of 2007 and one of my top ten favorite movies of all time. 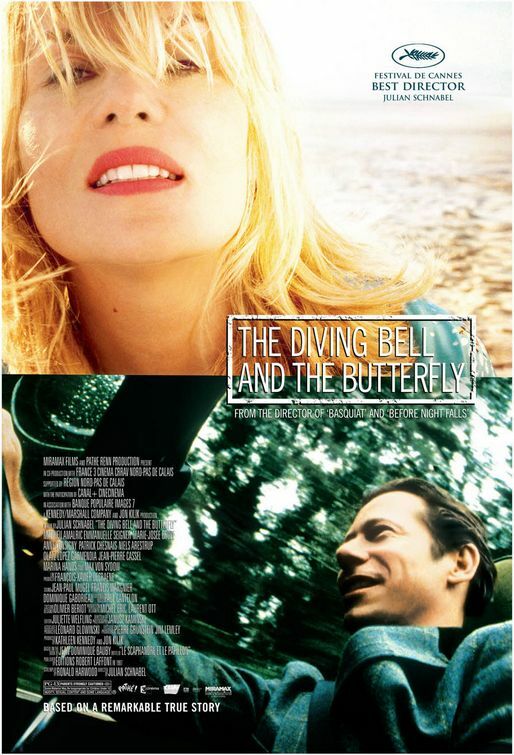 The Diving Bell and the Butterfly is a biopic about Jean-Dominique Bauby, a former editor of Elle magazine in France who suffered a stroke and was left completely paralyzed with the exception of his left eye which he utilized to write his memoir by merely blinking to his speech therapist every time she said a letter he wanted to use. That was a mouthful. I didn’t have any expectations going into this film since I hadn’t really heard of it beforehand, but I wasn’t paying for the ticket, so naturally I was on board. But once the movie started, it didn’t take long for my eyes to widen and my jaw to hit the floor. The Diving Bell and the Butterfly leaves you captivated from the very start and doesn’t falter throughout its running time. It’s not a documentary, but it is a true story and it’s told entirely from Bauby’s perspective. The director, Julian Schnabel, puts the audience right in Bauby’s shoes; we see what he is seeing, we hear what he is thinking, and we can’t help but empathize with him as we too come to the realization of his circumstances at the same time he does. You’ve never seen a movie like this and you won’t believe that you’ve never heard of Bauby by the story’s end. Bauby is played by Matthieu Amalric, an up-and-coming French actor who you might know as the main bad guy from Quantum of Solace. And even though that movie stunk and his wasn’t exactly a stand out role, he is fantastic in portraying Bauby both before and after his accident. It’s a constraining role to say the least, but even with just the use of one eye and a running inner-monologue, Amalric conveys an incredible range of emotions that had me laughing at times and brought tears to my eyes at others. All the actors are great in this movie, but ultimately it’s all about Bauby and Amalric’s genuine portrayal of him as a man finding the will to live in a prison of his own flesh. Watching this movie is like watching an artist paint his master work. Schnabel does absolutely astounding things with the camera, things I have never seen before which utterly floored me and continue to amaze me when I think back on them. The colors, the scenery, the point of view, the storytelling; it’s a beautiful experience and an absolutely stunning achievement on all fronts that needs to be seen to be truly appreciated. But even if you don’t care about how movies are directed, even if you hate having to read subtitles when you watch movies (get over it, folks), and even if you’ve never heard of this movie before, everyone owes it to themselves to watch The Diving Bell and the Butterfly. I’ve read Bauby’s memoir, and it was good, especially when you consider how it was written along with the author’s circumstances, but the movie outdoes it on every front. It is one of the most affecting and human stories I’ve ever seen conveyed through film and it will shake you to the core. Alex, you know what’s up, keep on forcing it down throats, everyone needs to see this movie, one of the best of the last decade if not THE best. Thanks for visiting, man. Hell of a first comment.